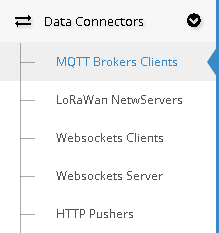 MQTT Broker is placed under the Data Connector menu. A MQTT Broker message is splitted into a Topic part and a JSON one. There isn't a standard structure so ResIOT owns some pre-configurated models. If you want to configure your own Connector you should know its format and let ResIOT understand it aswell. To do so, the first thing you have to do is to define a Topic for every type of communication. In Topic's Pattern table, you have to set up the right patterns in order for the software to understand what kind of communication is being handled. To do so, software has a list of Tags to help you to define them. <any>: anything you don't need, from an empty string to everything else until a "/" character is met. The Command field in Broker's TX define, in case you have multiple different TX patterns, which one should be used. For example, if you want to use the "NewTX" pattern just type "NewTX" into the Command Field while sending a TX Communication.